Team members with United Launch Alliance (ULA) prepare the Geostationary Operational Environmental Satellite (GOES-R) for encapsulation in the payload fairing inside the Astrotech payload processing facility in Titusville, Florida near NASA’s Kennedy Space Center. GOES-R will be the first satellite in a series of next-generation NOAA GOES Satellites. The spacecraft is to launch aboard a ULA Atlas V rocket in November. An Atlas V rocket is set to lift off Nov. 19 at 5:42 p.m. EST to deliver NOAA’s latest-generation weather satellite, GOES-R, into orbit. NASA is conducting the launch through its Launch Services Program. United Launch Alliance engineers are processing the rocket at Space Launch Complex 41 ahead of launch. 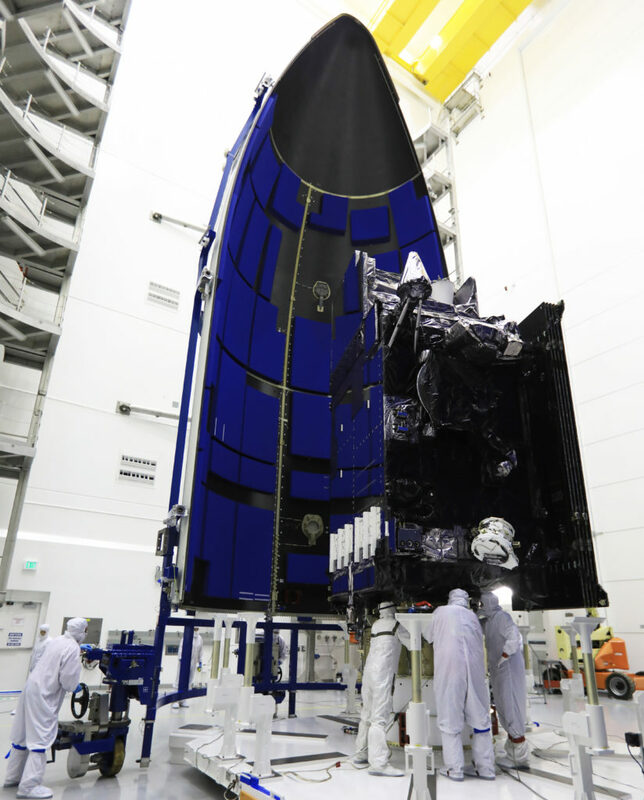 After several months of processing at Astrotech in Titusville, Florida, the GOES-R spacecraft has been encapsulated inside a payload fairing for protection during the climb through Earth’s atmosphere on the way to orbit. Carrying the most advanced sensors of their kind, the GOES-R spacecraft will fly more than 22,000 miles above Earth where it will offer weather forecasters an unblinking eye on conditions on the planet below.